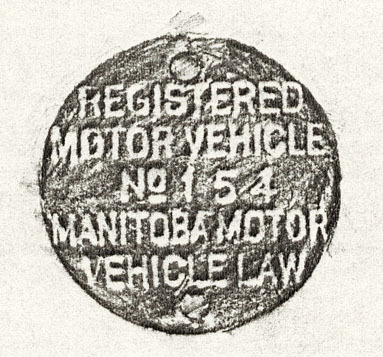 From 1908 until 1910, cars were licensed by issuing a registration paper, and a round aluminum seal with numbers that would correspond to the car owner's homemade leather plates. The round seal was replaced in 1911 with an oval seal, which in turn was replaced halfway through the year with Manitoba's first porcelain plates in 1911. Here's an etching of one of these discs. It's diameter is 2".